They hailed from the Sandhills of Nebraska, the small farms of Iowa, and one-stop towns from Maine to Tennessee. They were called the “Old Timers” not because they were old, but because they’d seen and done and endured things the rest of us can hardly imagine. The term Old Timers was one of respect. They were to be revered. The Old Timers served the American people in days not so long ago—in days before we forgot who we are. Today, their stories serve as a model for addressing some of the greatest challenges the world has ever known. The Old Timer narratives were lost for a time, but not for good. They had been kept on paper, typed or written longhand, and archived, lovingly, caringly, as promised. Perhaps the Old Timers were just waiting in the wings for the moment when we could hear them—when we were in need of birdsong, or a lullaby, or a map with directions for the road ahead. At the right time, their tales of duty, perseverance, gratitude, kindness, compassion and honor would serve America and help lead her out of the woods. Here is a different kind of story. Not a story of the great man or the great event, but a narrative by and for the people. Here are 226 unknown men and women whose work in the woods, on the plains, and in the desert made it possible to live the lives we do, who held a mirror to our deepest selves. Here are men and women we can be proud of, whose words matched their deeds, who were humble, grateful, and full of anticipation for the America that was yet to be. Here is a reason to fall in love all over again with the dream of America as it once was and will be once again. In 1905, practically no one knew what a professional forester was or why a trained and tested cadre of men with badges and green uniforms should be sent out like satellites into the darkest, most barren reaches of America. But Pinchot knew: conserving America’s resources meant not just conserving her water, trees, and wildlife, but finding the individuals who were committed to conservation and putting them to work. "My forbears came from New England as pioneers to western New York when it was a wilderness inhabited by Indians and wild animals. Pioneering was in their blood, and ere long, some of them pushed farther west into the wilderness of Ohio, Michigan and Wisconsin. Then, later, cousins slightly older than myself went to Iowa and Nebraska to do their parts in the settlement of those regions. In time one, an aunt, returned to New York State and very vivid is my memory of her accounts of their struggles in trying to make houses in those then far-away places. The story thrilled me, those early settlers were tillable-land-hungry. Therefore, they considered the forests as liabilities rather than assets, since they possessed nothing but their brawn and muscle to clear the land. On the other hand those who went to the plains region wished there were trees there with which to build log houses instead of making them with sod, but they had scant or no means of communicating with their people back East and telling them that they had come to know the values of forests. So time went on until it was discovered that our priceless inheritance was being destroyed to such an extent as to alarm certain public-spirited people, and a movement began which resulted in the passage by Congress of the Act of March 3, 1891 authorizing the creation of the “Forest Reserves.” Previously, however, under an act dated September 1, 1890, the first reserve was created in California, which covered some of the area now within the Sierra National Forest. The Grand Canyon in Arizona, on February 20, 1893." In 2005, six tattered blue boxes were unearthed in the Library of Congress’s Pinchot Collection in Washington, D.C. Inside were 5,000 pages of first-person narratives describing the work of early natural resource conservation professionals. The boxes were labeled “The Old Timers.” Penned between the first class of American Forest Rangers and first Chief of the U.S. Forest Service Gifford Pinchot between 1937-1941, the narratives offer a chronology of conservation efforts directed by President Theodore Roosevelt and led by Pinchot between the years 1905-1910. 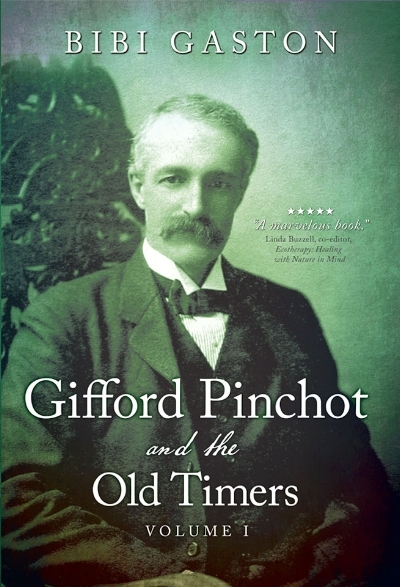 "Gifford Pinchot and the Old Timers" offers us a mirror to the America we once were, and a guidebook for the road ahead. These narratives tell of extreme hardship, fearless struggle, confrontations with cattlemen, miners, and loggers, and the challenge of turning conflict into cooperation and gratitude. The narratives record the creation of the first U.S. Forest Service Nursery and early reforestation efforts. They describe the search for nursery sites and efforts at water conservation. The young men and women who joined the "Fight for Conservation" lived a life of service. To most, it was the best life they could imagine. They were grateful for the chance to live a life dedicated to the future well-being of all Americans and to the natural world. Annual meeting of The Society of American Foresters, Oct 18, 1915. Panama Pacific International Exposition, San Francisco. By P. Cardinell-Vincent Co. Official Photographers. Courtesy of Library of Congress Manuscript Division, Gifford Pinchot Collection.